Smalec, referred to a poor man’s butter, is often presented at the beginning of a meal in Poland, something gratis, like chips and salsa or a basket of warm bread. Smalec also goes well with beer or vodka, making it perfect to share with friends late at night when the discussions are getting serious and philosophical. 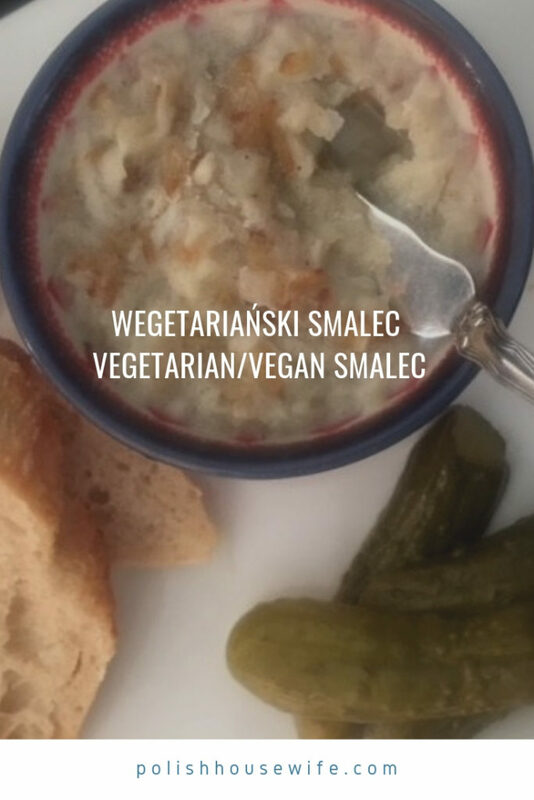 Now you can share Wegetariański Smalec – Vegetarian/Vegan Smalec to be sure all of your friends can join the fun. 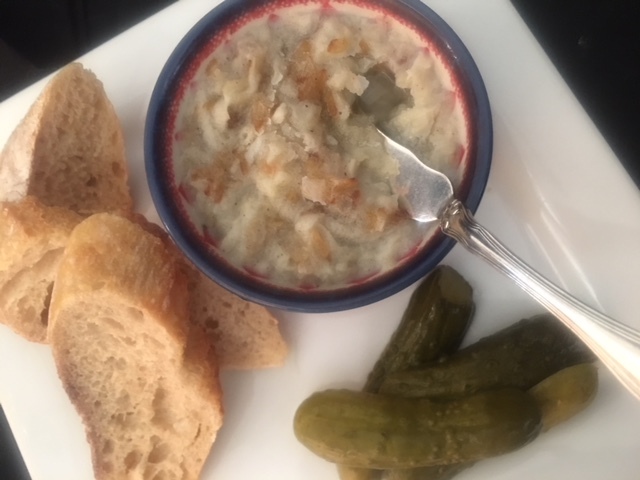 Traditional smalec is made with rendered pork fat and something we enjoy a lot, but when I made this meatless version recently even my carnivore husband thought it was fantastic. I’d planned to talk about how I saw a bigger need for meatless recipes in the US compared to Poland. I know all surveys have a margin of error and when the sample size is as small as the people I know, the results can be misleading. I participate in the Amazon Associates program and earn a commision on your purchases via the Amazon links below. Of the dozen people who might gather around our table at Christmas, 4 out of 12 wouldn’t eat traditional smalec. I know Poles give a lot of thought to the health consequences of their food, but 25% of the people I know in Poland wouldn’t be considered vegan, vegetarian, pescitarian. Imagine my surprise to find a report that listed the percentage of the US population that is vegetarian or vegan as 13% and in Poland it was 15%! Wherever you fall on the chart, I think you’ll enjoy this recipe. Be sure to saute the diced onion in just a little bit of oil. If you put all of the oil in while you’re cooking the onions, they’ll boil rather than brown, and you really want that caramelized onion color. I thought I would cut corners, so I’m speaking from experience here. The melting point of refined coconut oil is 77 – 79 F, so you’ll want to serve this a room temperature. It’s very SOLID straight out of the fridge. 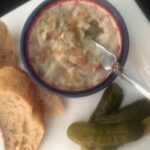 Serve your Wegetariański Smalec – Vegetarian/Vegan Smalec with a wonderful bread and small dill pickles. I’m glad to see that lard is making a comeback, maybe not in this particular recipe, but in general. Our Polish ancestors ate a lot of it and they were very healthy. A good amount of the fats in lard are monounsaturated anyway. And saturated fat has gotten a very undeserved bad rap. Nom nom! Just be sure to get natural lard and not one that has been artificially hydrogenated. I’m a big fan of lard! Very creative recipe, Lois! Coconut oil was my go-to when I was on my “no dairy” fast and it’s wonderful to see how very versatile it really is! Why aren’t you making it with pork fat; the way it should be made? I usually do make it with pork fat, but wanted to fix someone for a vegetarian friend.